What Is Good Fertilizer for Flowering Cherry Trees? 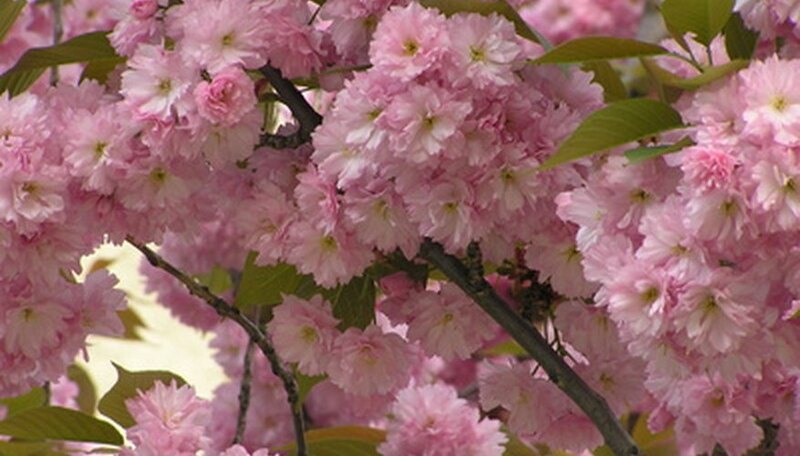 The nutritive needs of flowering cherry trees are no different than that of fruit-bearing cherry trees. In order to grow healthy, beautiful cherry trees that produce abundant blossoms each spring, a regimen of good maintenance, including watering, pruning, disease and insect monitoring, and fertilization, is required. The type of fertilizer needed will be determined by the environmental conditions in which the flowering cherry tree grows. A soil test based on samples from the site where the flowering cherry tree will be planted can help determine the type and amount of fertilizer needed to prepare the soil. The soil test can be conducted by your local extension office. The results will be accompanied by recommendations for soil additives to adjust the pH and nutrient composition of the soil. Tests can be repeated in later years if the tree is not showing adequate growth. Fertilizer, when added to the soil, enhances its nutritional content and improves various aspects of plant growth. Most flowering cherry trees can benefit from a balanced blend fertilizer with compositional values of 10-10-10 or 12-12-12. These values represent the nitrogen (N), phosphorus (P) and potassium (K) mix in the fertilizer. Nitrogen is responsible for promoting foliar growth. Phosphorus helps develop roots, and potassium aids in photosynthesis and in stem or limb growth. Commercial fertilizer blends come in a variety of mixes. Some add micronutrients to the mix and, depending on the results of your soil test, this may be beneficial. Check the label carefully and purchase a blend that meets but does not exceed your requirements. Too much of the wrong nutrient can cause problems. Compost made from a blend of animal manures and plant matter is heated over time to cause a rapid breakdown of the components. The result is highly nutritional organic matter that can be added to the soil prior to planting or worked into the top few inches around the tree as needed. The difficulty with homemade compost is there is no telling how much of one nutrient or another is contained in the mix. It depends purely upon the ingredients used to make it. Commercially prepared composts give you a content analysis on the package. Manure is another good choice for fertilizing flowering cherry trees. In addition to adding organic matter to the soil, which loosens it so roots can grow easily, manure adds many of the same nutrients as commercial fertilizer, though generally in smaller amounts. Homemade manure needs to be cured for six to 12 months before using, depending upon the animal source, in order to burn away any ammonia content that could harm plants. Commercially prepared manure is ready to use immediately. Which Fertilizers Have Red Phosphorus in Them? How Do Different Amounts of Fertilizer Affect Plant Growth?